Callistus A. Agbaam who graduated from the MA in Development Management and is now working for an environmental education project has been interviewed by the Alumni office of Ruhr University Bochum/Germany. See http://www.ruhr-uni-bochum.de/alumni/alumni-interviews/agbaam.html for the full interview. 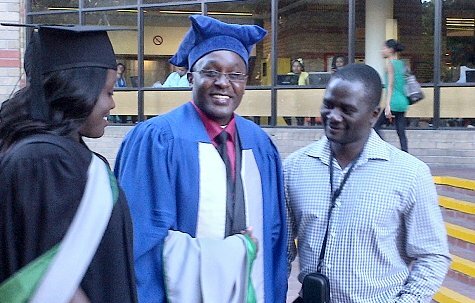 DAAD Student Felix Lombe from Malawi has been awarded the degree of a Doctor (Ph.D.).in Development Studies. He received a DAAD-funded scholarship of the Development Research Division of the South African-German Centre for Development Research and Criminal Justice for his doctoral studies. His thesis, "The Quest for a Development State in Malawi: A Developmental Social Policy Framework", was supervised by Prof. J. Adesina. Thirteen Master students of the Bochum Program of Development Management at the University of the Western Cape (UWC) in South Africa recently started to work together with the Iliso Care Society (ICS), a non-profit organization supporting various community development activities in the township of Khayelitsha near Cape Town. As part of a course module on "Planning, Monitoring and Evaluation," the students from Botswana, Ethiopia, Germany, Ghana, Kenya, Malawi, Portugal, Zambia and Zimbabwe conducted practical planning exercises to support two on-going programs of the Iliso Care Society, namely the Iliso Youth Choir and the Iliso Feeding Scheme. Beyond the one-off planning exercise, the majority of the Master students have pledged their longer-term commitment to support the Iliso volunteers by sharing their experience and academic knowledge. On Friday, 8 February 2013, the Institute of Development Research and Development Policy (IEE) of Ruhr University Bochum (RUB) and the School of Government (SoG) and Institute for Social Development (ISD) of the University of the Western Cape (UWC) celebrated "10 Years of Cooperation" at the UWC in Cape Town/South Africa. After the Opening Address of Prof. Brian O' Connell, Vice Chancellor of UWC, MC Dr. Gabriele Baecker invited Mr. Roland Herrmann, Consul General of the Federal Republic of Germany, Dr. Ralf Herrmann, DAAD representative in Johannesburg/South Africa, Prof. Wilhelm Löwenstein, Vice Rector of RUB, a current (Coretta Jonah) and a former scholarship holder (Callistus Agbaam) of the SAGER CDRCJ and Prof. Julian May, Director of the ISD, to give a speech on the very successful cooperation of these institutions. The Programme was accompanied by a marvellous choir from Khayelitsha/Cape Town. The ceremony was followed by a reception, at which the members of the steering committee (Prof. W. Löwenstein, Prof. J. May, Prof. Ch. Tapscott, Dr. G. Baecker) together with the coordinators of the Centre (Ina Conradie and Britta Niklas) welcomed about 120 guests. Please see also the article on the website of the University of the Western Cape: Celebrating 10 years of collaboration between UWC and Ruhr University Bochum. First Networking Conference and Alumni Seminar on "Evaluation of Projects and Politics" took place! With the support of the German Academic Exchange Service (DAAD), the first Networking Conference and Alumni Seminar on "Evaluation of Projects and Politics" was organized by the Development Research Division (DRD) of the South African-German Centre for Development Research and Criminal Justice. The South African-German Centre for Development Research and Criminal Justice offers Postdoctoral Fellowships in 2013. For further information, please have a look here; if interested, find application form here. After successful defense of his PhD thesis on Monday, 28th January 2013, Beneberu Assefa Wondimagegnhu from Ethiopia has been awarded the degree of a Philosophiae Doctor (Ph.D.). As a member of the International Development Studies Doctoral Programme he received a DAAD-funded scholarship of the Development Research Division of the South African-German Centre for Development Research and Criminal Justice for his doctoral studies. His thesis on "Economic Impact of Rural-Urban Migration on Income and Poverty of Migrant Sending Households: With Evidences from Southern Ethiopia" was supervised by Prof. Dr. Bender. Second supervisor was Prof. Dr. Löwenstein. Silas Udahemuka, participant of the PhD in International Development Studies and scholarship holder of the Development Research Division of the South African - German Centre for Development Research and Criminal Justice, has been selected as a new member of the African Good Governance Network. More information on the network is available here. The first paper of our new "SA-GER CDRCJ Research Paper Series" is published. The Paper of PhD student Silas Udahemuka (2012):" 'Dead aid'? Just a false victim of the quasi-monopoly of aid-growth linkage." can be downloaded here or directly from the "Research Section" of our website. As part of and with the generous support from the German-South African Year of Science, the Development Research Division of the South African German Centre for Development Research and Criminal Justice cordially invites you to participate in its Advanced Year of Science Publication Workshop. 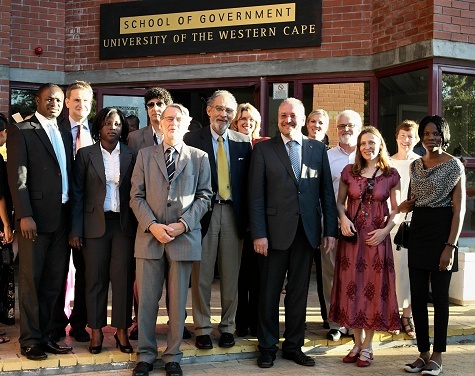 The workshop takes place at the University of the Western Cape, Cape Town, South Africa, from the 11 - 15 February 2013. For more information see also "Call for Applications". The deadlline for the "Call for Applications" already expired!